On December 5h Cyclopean Eye Productions will release the new EP by the Sri Lankan noise terror trio Konflict, and today we present a full stream of all six brain-mangling body-mutilating tracks. Crafted as “a blood-curdling retaliation against their homeland’s perpetual degeneration,” Trigger Universal Conflict is a dystopian sonic nightmare, a remorseless assault of harsh noise, grindcore, and black/death metal with devastating consequences. It lasts only 18 minutes, but long enough to leave a listeners shivering in fear, with heartbeats hammering and lungs gasping for air. The wreckage of your senses begins with the amalgam of abrasive radioactive noise and urgent voices that opens “Finish It Off (The Way It Has to Be Done)“, a preamble that’s eventually wiped off the map by a hyper-speed snare-drum assault (segmented by malefic explosive eruptions), waves of cavernously deep undulating bass tones, and the generation of persistently needling and corrosive guitar reverberations. What was a poisonous appetizer at the outset of the first track becomes a full course in the second one, “The Sword Which Is Mightier Than the Pen“, which is completely given over to a discharge of skittering, warping, and shrieking electronic noise, over which the band layer a cacophony of hectoring male and female voices, which grow increasingly frenzied and infuriated. Where vocal samples provide the throated sounds in the first two tracks, “අයං විනසනාම කාලෝ” introduces horrid guttural roaring and frightful howls, along with grotesquely distorted voices, over a monstrous typhoon of hyper-blasting drums and a pestilential mix of deep, roaring and abrasive buzzing tonalities. Lest you begin to think from these words that Konflict have little or no use for rhythms or riffs, “Inflict Konflict” presents a more head-moving bass line and variations in speed, with methodically head-spiking snare beats mixed in with those light-speed percussive attacks — without surrendering the terrorizing effect of the bestial vocals or the band’s hateful devotion to abrasion. 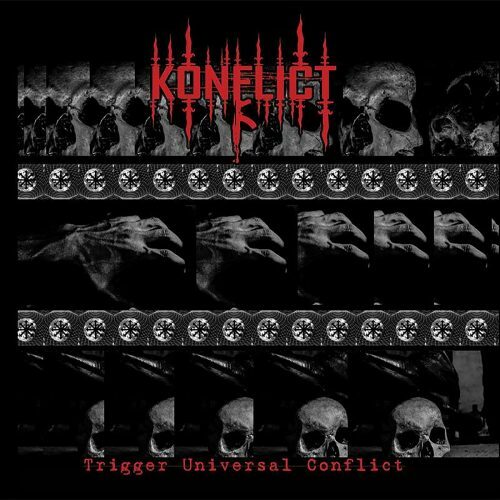 After another nightmarish harsh-noise track (“White Van Death Squad Protocol“), which features gruesomely distorted speaking voices, Konflict end the EP with the title track, which is also the best of the six. It again deploys hyper-blasting drum-kit destruction (mixed with skull-snapping beats and cymbal crashes), grotesque vocals, those uber-deep bass tones, and plenty of toxic guitar abrasion — which resembles the brain-boiling tumult of some horrid industrial factory operating on overdrive — but the track also incorporates some head-hammering body-moving bass rhythms, almost like an EDM rave in the midst of a nuclear attack, or perhaps more like a cataclysmic earthquake operating with its own punishing rhythm. Trigger Universal Conflict will be out on December 5th but you can order it now. Prefer Nyogthaeblisz, Intolitarian, Tetragrammacide, Subduer etc. Konflict is very boring, generic and lack uniqueness of these aforementioned bands. Check out Radon Trench in same style of Konflict but atleast 10 times better than this snooze fest.